Ray chose Michigan Tech for its reputation and camaraderie. He feels like he found his tribe on campus and in the workforce. Design, build, and test products that solve challenges, in a program that ranks in the top 20 nationally for bachelor’s degrees awarded (like it has for 30 years), with a 98 percent job placement rate. Mechanical engineers apply the principles of motion, energy, force, and materials to design products that are safe, efficient, reliable, and cost effective. Learn to design components, devices, systems, and processes that will help solve today’s biggest challenges in health care, transportation, climate change, and more, while working in industries such as aerospace, automotive, biomedical, communications, nanotechnology, and power-generation industries. Experiment with real-world applications alongside faculty, in 50,000 square feet and 12 stories of department labs and computer centers. Build an understanding of core engineering principles early on. Working alongside faculty in state-of-the-art facilities including the Microfluidic and Interfacial Transport lab, Advanced Automotive Engine lab, Advanced Space Propulsion lab, and the Skeletal Tissue Mechanics and Mechanotransduction lab. I heard through relatives and friends that Michigan Tech was a good school, it had a good reputation in engineering, which was enough for me to apply. After a campus visit and seeing the surrounding area, I knew that it was the place to further my education. 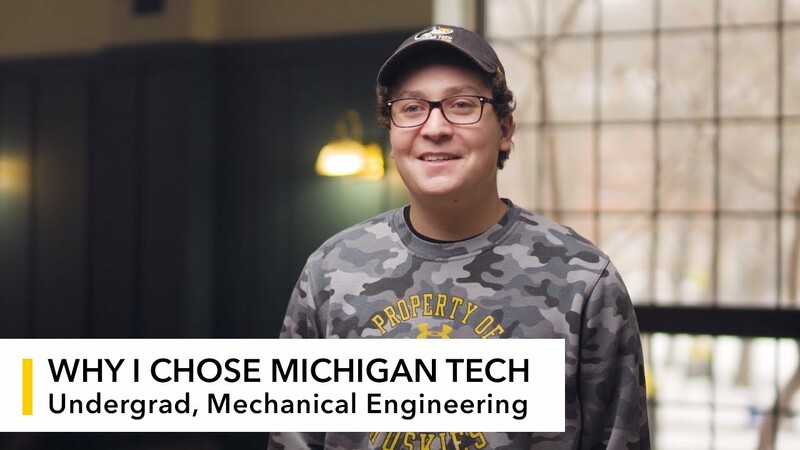 Learn more about mechanical engineering at Michigan Tech!